The 7 Best Gelato Places in Iowa! For those that don’t know, gelato is a cold dessert made popular in Northern Italy. It’s similar to North American ice cream, but contains less air and fat content. While gelato shops are far less common than ice cream in the state of Iowa, there are still a handful of gelato shops that specialize in this Italian treat. After your first bite at one of these excellent gelato shops, you may never go back to regular ice cream again. Here are the 10 best! Capanna Coffee and Gelato is the premier place in Iowa to get a variety of gelato flavors, and within their headquarters in North Liberty, you can expect to find just the taste you’re looking for. Featuring a full selection of seasonal gelato flavors, Capanna also has a full-service espresso bar that can pair nicely with your selection. Grounds for Celebration really does give you a good reason to celebrate, and through their large selection of fresh gelato flavors, plus a full-service espresso bar to order a drink, every time is a good time when visiting this spot. Featuring a welcoming atmosphere and friendly space, plus free Wi-Fi, to really enjoy Grounds for Celebration for what it is, it’s worth ordering of your favorite flavor of gelato and sticking around for a while. Located on Main Street in Ames, Chocolaterie Stam is a chain-based business, but this locally franchised storefront delivers on both friendly customer service and a wide selection of chocolates, treats and your favorite flavors of gelato. While there are many things to catch your eye at the Chocolaterie Stam in Ames, the gelato is what can make your visit a special one, and no matter the flavor of the day, you’ll find many reasons to come back for more with your first visit to the Chocolaterie Stam. While Your Pie in Davenport specializes in craft pizza and other Italian-inspired recipes, this new pizza restaurant also specializes in hand-crafted gelato. Featuring a wide selection of gelato flavors that nearly rivals the even wider selection of pizza ingredients, with just one visit to Your Pie Davenport, you’ll see for yourself that nothing pairs better with fresh pizza than a heaping helping of smooth gelato. Serving as both a place to dine out and a place to shop for special ingredients, +39 Italian Restaurant has everything you need for a special night of eating, including a wide selection of premiere gelato options. +39 Italian Restaurant is new to the Des Moines scene, but with their wide selection of delicious entrees, fresh ingredients and some of the best gelato in town, +39 is looking to become a Des Moines institution for years to come. While many people stop into Scooter’s Coffee to grab a coffee, those who know good gelato, know Scooter’s has some of the best. 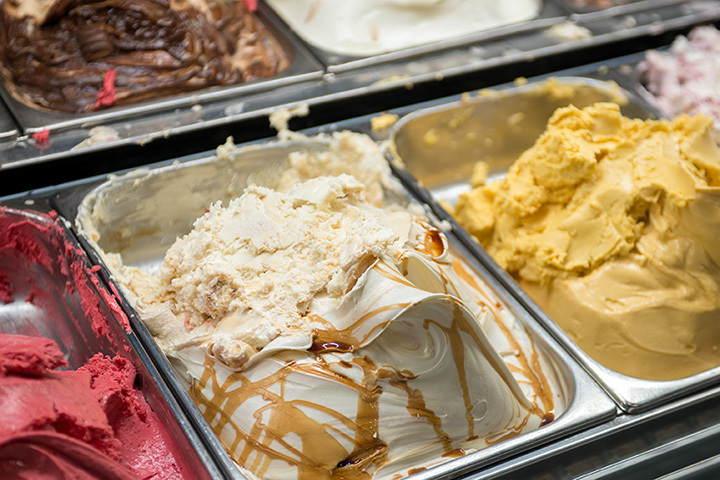 Featuring constantly rotating flavors of the day, you can try a new taste of gelato with every visit. Thanks to the fresh ingredients and hand-crafted process, chances are you are going to like every bite. With a welcoming atmosphere that invites you to sit awhile and enjoy your gelato, it’s worth carving out a little extra time in your day for a trip to Scooter’s to enjoy the flavor of the day. Monica’s on the Coralville Strip isn’t just a gelato destination, it’s a full-service restaurant that offers American and Italian cuisine that can’t be beat. Whether you go for brick-oven pizzas or specialty hamburgers at Monica’s, there is little better way to top of your meal than the selection of gelato desserts you can find on the menu. There is a lot to choose from at Monica’s, and many potential new favorites, and while gelato should be on top of your list for your next visit to Monica’s, be sure to explore all the other tasty entree and appetizer items found on the menu.